The army consists of the Army Headquarters, the three army commands, the Aviation Command, and the Special Warfare Command. The army possesses component units including 11 corps, 49 divisions, and 19 brigades, some 560,000 troops, some 2,360 tanks, 5,180 pieces of field artillery, and 2,400 armored vehicles. The ground forces are organized into three armies and several independent operational and functional commands. Functional commands included the Counterespionage Operations Command, subordinate to the chairman of the Joint Chiefs of Staff and responsible for interdicting North Korean saboteurs and espionage agents; the Defense Security Command, the army's internal security organization; and the Logistics Base Command, which was established to manage the movement of supplies to the frontlines. Active-duty infantry units are organized as combined armed forces with armor and artillery forces subordinate to the division or brigade commander. The Third Army and First Army controlled nineteen infantry divisions and two mechanized infantry divisions. Each corps and division has its own artillery unit to provide its task forces with effective fire support. These artillery units possessed various sorts of artillery, targeting equipment, fire-control systems, and high-tech weapons that make them capable of timely and sustained fire support. Technology has linked various firearms, target acquisition equipment and fire control systems in each artillery unit, which made it possible for each artillery unit to provide continuous, timely fire support. In 1987 each infantry division had about 14,716 soldiers, but in terms of transportation and communications and other equipment it was considered "light" by United States standards. Each infantry division had four battalions per regiment, three infantry regiments and one artillery regiment per division, a reconnaissance/ranger battalion and an armor battalion (some only had armor companies), and a reasonable facsimile of combat support and combat service support units in comparison to United States counterparts. The mechanized infantry divisions each had three mechanized/maneuver brigade headquarters, a cavalry battalion, and a mix of nine armor and mechanized infantry battalions. To conduct offensive maneuver warfare, the ROK military gained offensive maneuver capability by reorganizing some of its infantry divisions into mechanized units. It reorganized other infantry divisions as well, and increased unit force capability with new firearms to secure combat capability at the initial stage of a war. To construct a real-time integrated firepower operation system, the structure of the ground force is being reorganized systematically to enhance fire support capability, and artillery units are gradually being transformed to autonomous ones to enhance mobility and shorten operational reaction time. The computerization of fire direction systems and the utilization of long-range striking systems and target acquisition systems have also contributed to the efficiency of fire operation. The National Defense Reform Committee (NDRC) was set up in April 1998. Devoted to implementing the Five-Year Defense Reform Project (1998-2003), it produced a report three months later. Its remit was to suggest ways of making the military more efficient, transparent and cost-conscious, in order to strengthen the ROK defense pos-ture "to meet the full spectrum of threats that may emerge in future." Under the slogan "building an elite force," the long-term policy was for a reduction of the nation's 690,000-strong military force to between 200,000 and 300,000 personnel by 2015. This did not happen, and by 2015 the Army retained the 522,000 active duty personnel it had in 2010. A Chemical-Biological Defense Command was established in 1998 as part of an integrated plan to counter DPRK chemical and biological weapons threats. The Defense Transportation Command was set up to coordinate and manage the transport assets of the three armed services. It is also responsibility for mobilization of civilian aircraft, vehicles and ships in time of war. The Army Aviation Unit and the Air Assault Brigade were reorganized into the Aviation Operations Command. The Ground Operations Command was to replace the existing 3rd and 1st Field Armies, in charge of the defense of Seoul and Kangwon Province, with strengthened operations and intelligence missions. The 2nd Field Army, covering rear areas, was to be disbanded and restructured, and the two Army Corps under its command were to be deactivated. In 2000 it was announced that as a part of defense reform, the plan to restructure two field army commands and two corps commands would be carried out based on the future military structure research project results. According to this plan, two field army commands located in the forward area would be replaced with the newly created Ground Operations Command, and two corps commands in the rear area would be replaced with the newly created Rear-Area Operations Command. The FROKA and the TROKA are being merged into Ground Operations Command (GOC), and the SROKA is being renamed as Rear Operations Command (ROC). GOC was to be responsible of defending the Demilitarized Zone (DMZ) from possible Korean People's Army (KPA). Under Defense Reform 2020, the 15-year military modernization program announced in 2005, the Army, which had largely been dependent on force strength, planned to deploy high-tech tanks and armored fighting vehicles that combine firepower and battlefield mobility. The ROK Army force structure was still relatively focused on infantry units -- 17 of the 22 active duty divisions. The service planned to cut more than 20 of its 47 active and reserve divisions and turn many of the remaining ones into mechanized units. The number of its corps was to decrease from 10 to six. The key idea was to balance-out the army-oriented proportion in the number of forces and staffing in the central military organizations. The ROK Army was to restructure it by reducing the numbers of army corps and divisions, as reinforcing the combat capability of each unit in twice to three times. The Army was to also secure weapons and equipment with high combat efficiency and increase the unmanned aviation vehicles, next generation tanks, armored personnel carriers, firepower system, simplifying the command structure so that it can transform into a modernized organization. 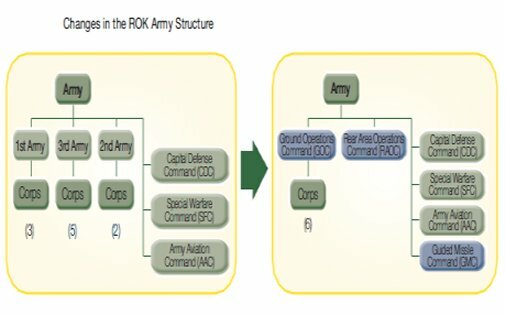 Once again it was announced that the ROK Army would integrate the FROKA (First ROK Army) and the TROKA (Third ROK Army) to create the Ground Operations Command (GOC), while changing the SROKA (Second ROK Army) into the Rear Area Operations Command (RAOC). The Rear Area Operations Command (RAOC) was finally established in 2007, while the Ground Operations Command (GOC) was expected to be operational by 2010 [that is, over a decade after this proposal was floated by the National Defense Reform Committee (NDRC) in 1998]. Furthermore, the general outpost (GOP) guard systems which have been maintained for 50 years since the Korean War would be replaced by guard brigades equipped with advanced guard systems, which will, in turn, reduce the number of guards and reinforce the quality of the guard system. Under its ambitious Defense Reform 2020 plan, the ROK military strives to be a more modern and agile fighting force. Its goal is to develop a self-reliant, technology-oriented, qualitative defense force. As a result of its emphasis on technology under this plan, the ROK planned to reduce its total (active and reserve) Army ground forces by approximately 45% leading up to its target date of 2020. The overall active and reserve forces would be reduced from about 3.7 million to about 2 million. Nearly all of the DRP personnel reductions would come out of the army, which would have one-third of its personnel reduced. Associated with this personnel reduction would be a significant reduction in the ROK Army force structure, in particular decreasing the current force of 47 divisions (active duty and reserve) down to a force of about 24 divisions. The 2020 force would also have four Mobilization Reserve Divisions (MRDs) "activated in wartime," though it is not clear how these would differ from other reserve divisions. The DRP calls for replacing the antiquated ROK Army equipment (such as M-47 and M-48 tanks) with far more capable equipment (e.g., the K2 tank). In 2009 the Ministry of National Defense revised the Defense Reform 2020, amid growing calls to prepare for North Korean asymmetrical threats and its nuclear and missile programs. The first revision called for securing independent capabilities to remove such North Korean weapons by deploying sophisticated surveillance, reconnaissance and precision-strike assets. Key procurement items included high-altitude unmanned aerial vehicles, a ground-based early warning radar, PAC-3 interceptors and SM-3 ship-to-air missiles. The Army is supposed to triple the number of its K-9 self-propelled howitzers and multiple launch rocket systems to counter attacks by the North's long-range artillery near the border under the plan. The military readjusted its target troop cut number to 517,000. The original plan called for reducing the troop level in all services, not just the Army, from 690,000 to 500,000 by 2020.